This guest post comes to us from Morgan Hubbard, a talented masters student in Public History at the University of Massachusetts-Amherst. Hubbard reflects on his creation of an on-line exhibit, which he launched “to explain the explosion of science fiction on the American literary scene in the first two decades of the cold war era.” He describes some of the challenges of doing history on the web and explains what worked best. Presenting history can be as hard as all the research that comes before it. This seems to be especially true for web exhibits. How do we give readers enough structure so they won't get lost, but not so much that we overpower the web's ability to render history vividly and dynamically? 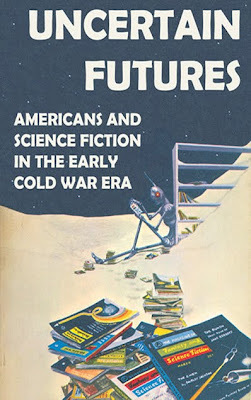 I recently did some research on American science fiction readers from 1945-1965, for a class Heather Cox Richardson taught last semester at UMass-Amherst called “Writing History for Popular Audiences.” The research was a breeze. The hard part, it turns out, was trying to present my findings in a web exhibit aimed at a non-specialist audience. 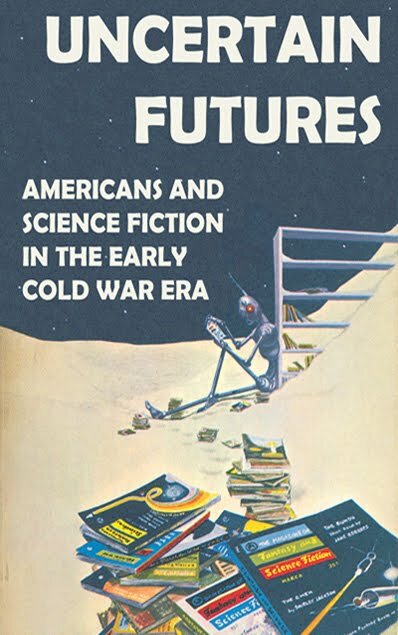 The result is Uncertain Futures: Americans and Science Fiction in the Early Cold War Era; you can judge its worth for yourself. But I thought it would be worthwhile to write briefly about some of the ways I think we, as historians, can put the web to good use. First, a web exhibit allows for layered content—think footnotes, but better. Text can link to other sites, or it can serve as a kind of inline footnote for extra content. I tried both with this exhibit. Good use of images, too, can give an exhibit a layered feel—I think the images in Uncertain Futures are crucial to the story, so I used a script to activate an optional slideshow of each page's images when a reader clicks on one of them. And, finally, sound makes history dramatic. I conducted an interview, a sort of oral history, with the founder of the UMass Science Fiction Society; that interview is embedded in the “Fans and Fandom” page, with a simple player. Second, and more importantly, it seems intuitive that readers will interact differently—maybe in a nonlinear fashion—with web exhibits than with the traditional media of historical scholarship. Books have introductions, arguments that build sequentially, and tie-it-all-together conclusions . . . but the chances seem vanishingly small that readers of my exhibit will start at the beginning and then work methodically to the end. How to deal with this? I tried to provide as many “signposts” as I could, in the form of chapter subtitles. At the time I was going for cleverness, but in retrospect I should have made these subtitles much clearer. Ideally, subtitles—and the navigation panes at the top of every page—can provide readers with a map of the exhibit's narrative arc, from intro to conclusion, visible from anywhere in the exhibit. There are some great resources available for researchers thinking about how to present history online. George Mason University’s Center for History and New Media has a suite of tools and publishing platforms, available for free. And the University of Maryland’s Public History Resource Center has some good criteria for evaluating history websites, and a lot of helpful website reviews. These are only two—there are plenty more. Whether the web will change traditional historical scholarship remains to be seen, but it seems clear that public history has already been altered—and for the better!—by the online world. This is lovely. I have thought how cool it would be to a web class this way, and this suggests it could actually be done (although would obviously take an enormous amount of work). I assume you're following the gradual blending of blogs and magazines. Seems to me this project is on the cutting edge of that development. A question, though (and likely a stupid one): how do you start something like this? Is there a special program someone would use? Do universities have their own platforms? Where would a neophyte start? There are some programs like Dreamweaver designed for people (like me) without programming languages. I found it easier just to learn basic HTML and CSS (the first for the content on the pages, the second for how that content looks), and then build the exhibit from scratch. There are some handy guides out there for beginners...the Missing Manual series helped me a lot. I also leaned heavily on a few people who're more familiar with web design than I, and they helped with the more difficult things, like setting up the page templates and getting all the scripts to work well together. I actually thought briefly about making this exhibit more like a blog, but then thought that I'd feel pressured to keep adding to it ad infinitum. This way, it's done, and I can move on. Heather, happy to answer any more questions about this...the project was fun to do! VERY COOL website! Congrats, Morgan. I've been fascinated with the idea of presenting history online, too. The nonlinearity is especially interesting, because each "thought" needs to be more or less freestanding, so it can link to many others. I've been playing around with Eastgate's Tinderbox, to organize my notes internally. But I think different logic applies to telling the story -- or do narrative conventions break down? Do people go right to the "chapter" of your website that most interests them, Morgan (like I did)? Or do they follow the path you set for them? I think that what you've outlined is an important discussion that will become more mainstream with time. I've incorporated quite a bit of digital history, or "New Media," into my courses with great success. I've found that it works particularly well in intro. classes. I applaud you for sharing your thoughts about how we can creatively share our research in a way that entices popular audiences to want to learn more! Well done, Morgan. You offer the viewer an opportunity to investigate the topic thematically and/or chronologically. The text and graphics are terrific--I want to learn more about the subject. We need more projects like yours and other cutting edge ideas not only to generate enthusiasm for history among the general public but to respond to the Glen Becks of the world who teach that Warren Harding was a better president than FDR. Historians need to share their work and open a dialogue with the general public. If not, someone else will. Great website and blog post. It's nice to see what was a great idea in class come to such vivid fruition. This certainly inspires me to think in some new directions about how to get work "out there."